With the new grilled pizza cookbook we received as well as our grill gadget pizza oven, we have been experimenting with different types of pizza. We do run into a few pizza competitions each summer and perhaps a new creation will turn out to be a winning entry sometime in the future. 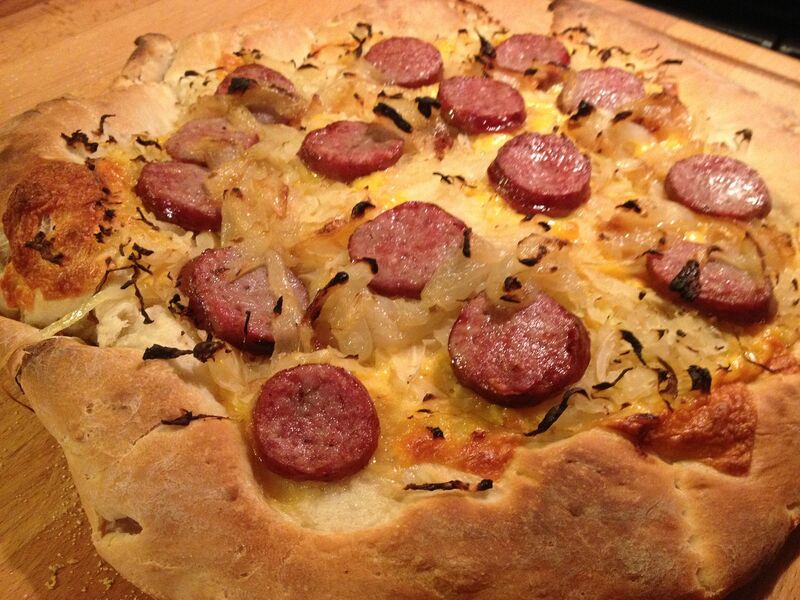 After leafing though the pizza cookbook, I was inspired by a ballpark style hot dog pizza. Hot dogs are good. 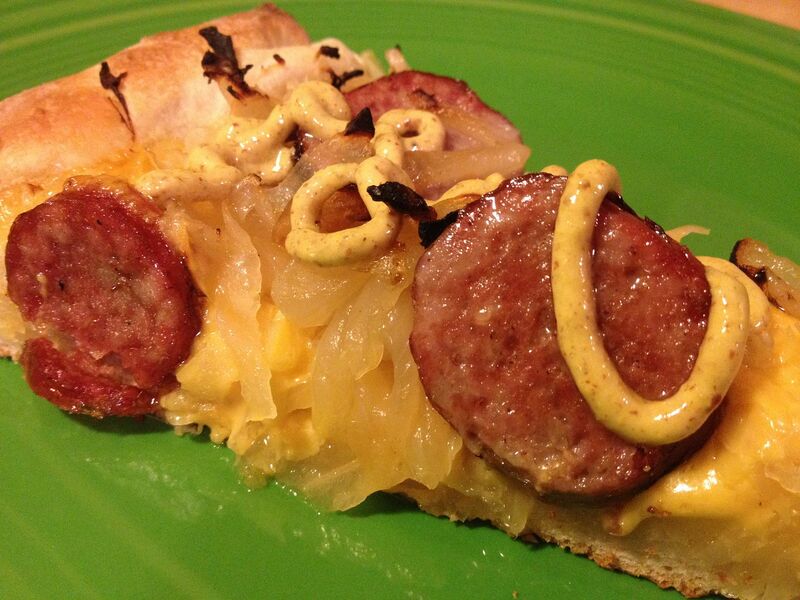 Bratwurst is even better. Chedarwurst, brats peppered with little bits of cheddar goodness, are my favorite. I felt a pizza experimentation coming on fast. Here is what we came up with one warm Friday evening. Hope made a batch of dough. While the dough was rising, I simmered two fresh brat links that I had picked up from my butcher earlier that day in some Penn Dark. I always simmer on low heat for about 15 minutes, or just until the casing on the link starts to expand. At the same time, I caramelized half of a medium sweet onion. Finally, I took a quart of homemade sauerkraut that a friend of The Oldest makes every year and dumped into a colander to drain. (One note should you decide to try this recipe. Do not use canned sauerkraut. Buy the fresh stuff that you find in the plastic bag in the meat case, or make your own. The fresh kraut is crispy in texture and at the same time tart, but not sour like canned kraut.) 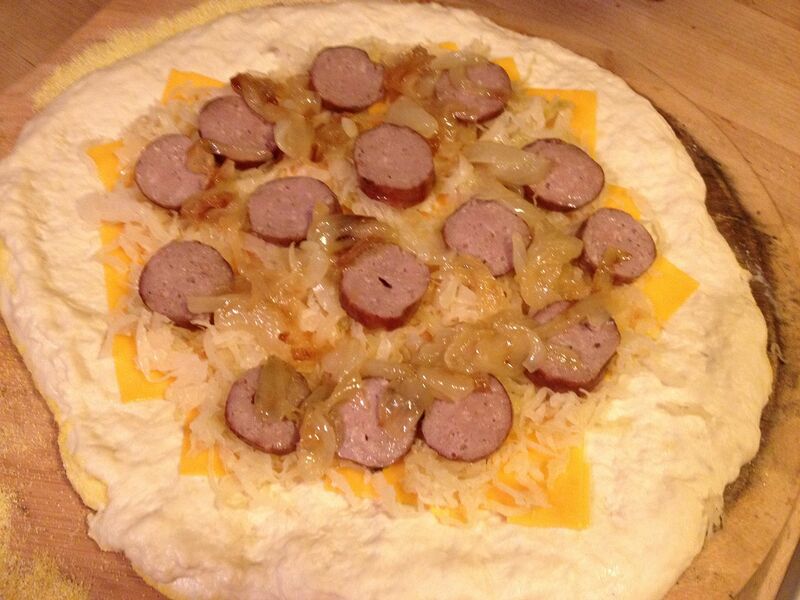 Once the dough was ready, I layered the pizza skin with a very thin coat of olive oil, thinly sliced sharp cheddar, sauerkraut, my caramelized onions, and then finally my bratwurst, sliced into quarter inch rounds. Eight minutes in the pizza oven later, and here was the final product. After slicing, I served with a little drizzle of spicy brown mustard on top. Good, but not quite there. I needed more onion, cheese, and perhaps a tough of garlic. But, the flavors are there. The bratwurst crisped up nicely and retained a bit of that beer infusion. The sauerkraut started to brown and caramelize in places as well. Perhaps some caraway seeds are in order. This experiment was a good start. I will be making this pie again with some modifications in the future for sure. Interesting combination. I am a new convert to the fresher sauerkraut sold at the farmers market. It is crisper and refreshing compared to the funky stuff my dad liked.